Small cell lung cancer (SCLC), previously known as oat cell carcinoma, is considered distinct from other lung cancers, which are called non–small cell lung cancers (NSCLCs) because of their clinical and biologic characteristics. See the image below. 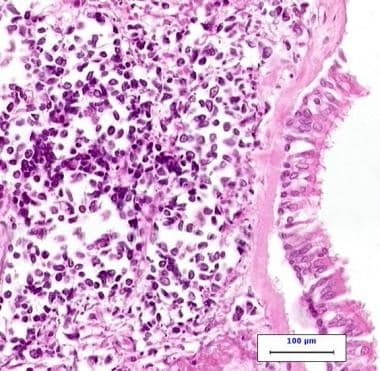 High-power photomicrograph of small cell carcinoma on the left side of the image with normal ciliated respiratory epithelium on the right side of the image. Also see the Clinical Presentations of Lung Cancer: Slideshow and Lung Cancer Staging -- Radiologic Options slideshows for additional information on SCLC staging and treatment. Small cell lung carcinoma (SCLC) arises in peribronchial locations and infiltrates the bronchial submucosa. Widespread metastases occur early in the course of the disease, with common spread to the mediastinal lymph nodes, liver, bones, adrenal glands, and brain. In addition, production of various peptide hormones leads to a wide range of paraneoplastic syndromes; the most common of these are the syndrome of inappropriate secretion of antidiuretic hormone (SIADH) and the syndrome of ectopic adrenocorticotropic hormone (ACTH) production. In addition, autoimmune phenomena may lead to various neurologic syndromes, such as Lambert-Eaton syndrome. All types of lung cancer occur with increased frequency in uranium miners, but SCLC is the most common. The incidence of lung cancer is increased further in these individuals if they also smoke tobacco. Exposure to radon, an inert gas that is a product of uranium decay, has also been reported to cause SCLC. Lung cancer overall is the second most common malignancy in both sexes in the United States, exceeded in frequency only by prostate cancer in men and breast cancer in women. [8, 9, 10] In both sexes, lung cancer is the most common cause of cancer death. Although less than half as many new cases of lung cancer than breast cancer are diagnosed in US women each year, almost twice as many US women die of lung cancer each year than from breast cancer. As with other histopathologic types of lung cancer, most cases of SCLC occur in individuals aged 60-80 years. Because tobacco smoking is the predominant cause of lung cancer, the only means of decreasing the incidence of this disease overall, as well as that of small cell lung cancer (SCLC) specifically, is to decrease the prevalence of smoking. The evidence is clear that the declining incidence of lung cancer in men in the United States has coincided with a decrease in smoking among males. Malhotra J, Boffetta P, Mucci L. Cancer of the lung, larynx, and pleura. Adami H, Hunter D, Laglou P, Mucci L, eds. Textbook of Cancer Epidemiology. 3rd ed. New York, NY: Oxford University Press; 2018. 327-54. Pietanza MC, Krug LM, Wu AJ, Kris MG, Rudin CM, Travis WD. Small Cell and Neuroendocrine Tumors of the lung. DeVita VT Jr, Lawrence TS, Rosenberg SA, eds. DeVita, Hellman, and Rosenberg's Cancer: Principles & Practice of Oncology. 10th ed. Philadelphia, Pa: Wolters Kluwer Health; 2015. 536-59. Cascone T, Gold KA, Glisson BS. Small Cell Carcinoma of the Lung. Kantarjian H, Wolff R, eds. The MD Anderson Manual of Medical Oncology. 3rd ed. New York, NY: McGraw-Hill Education; 2016. 323-42. Kalemkerian GP, Schneider BJ. Advances in Small Cell Lung Cancer. Hematol Oncol Clin North Am. 2017 Feb. 31 (1):143-156. [Medline]. Wynder EL, Graham EA. Tobacco smoking as a possible etiologic factor in bronchiogenic carcinoma; a study of 684 proved cases. J Am Med Assoc. 1950 May 27. 143(4):329-36. [Medline]. Pesch B, Kendzia B, Gustavsson P, Jockel KH, Johnen G,et al. Cigarette smoking and lung cancer--relative risk estimates for the major histological types from a pooled analysis of case-control studies. Int J Cancer. 2012 Sep 1. 131(5):1210-9. [Medline]. [Full Text]. Parsons A, Daley A, Begh R, Aveyard P. Influence of smoking cessation after diagnosis of early stage lung cancer on prognosis: systematic review of observational studies with meta-analysis. BMJ. 2010 Jan 21. 340:b5569. [Medline]. [Full Text]. Siegel RL, Miller KD, Jemal A. Cancer statistics, 2019. CA Cancer J Clin. 2019 Jan. 69 (1):7-34. [Medline]. [Full Text]. Govindan R, Page N, Morgensztern D, Read W, Tierney R, Vlahiotis A, et al. Changing epidemiology of small-cell lung cancer in the United States over the last 30 years: analysis of the surveillance, epidemiologic, and end results database. J Clin Oncol. 2006 Oct 1. 24(28):4539-44. [Medline]. American Cancer Society. Cancer Facts & Figures 2019. Available at https://www.cancer.org/content/dam/cancer-org/research/cancer-facts-and-statistics/annual-cancer-facts-and-figures/2019/cancer-facts-and-figures-2019.pdf. Accessed: March 20, 2019. Small Cell Lung Cancer Treatment (PDQ®): Health Professional Version. National Cancer Institute. Available at http://www.ncbi.nlm.nih.gov/books/NBK65909/#CDR0000062945__1. April 20, 2018; Accessed: May 24, 2018. [Guideline] Früh M, De Ruysscher D, Popat S, Crinò L, Peters S, Felip E, et al. Small-cell lung cancer (SCLC): ESMO Clinical Practice Guidelines for diagnosis, treatment and follow-up. Ann Oncol. 2013 Oct. 24 Suppl 6:vi99-105. [Medline]. [Full Text]. World Health Organization. Cancer fact sheet no. 297. Available at http://www.who.int/mediacentre/factsheets/fs297/en/. 1 February 2018; Accessed: May 22, 2018. Jemal A, Miller KD, Ma J, Siegel RL, Fedewa SA, Islami F, et al. Higher Lung Cancer Incidence in Young Women Than Young Men in the United States. N Engl J Med. 2018 May 24. 378 (21):1999-2009. [Medline]. Jackman DM, Johnson BE. Small-cell lung cancer. Lancet. 2005 Oct 15-21. 366(9494):1385-96. [Medline]. Janne PA, Freidlin B, Saxman S, Johnson DH, Livingston RB, Shepherd FA, et al. Twenty-five years of clinical research for patients with limited-stage small cell lung carcinoma in North America. Cancer. 2002 Oct 1. 95(7):1528-38. [Medline]. Wu C, Xu B, Yuan P, Miao X, Liu Y, Guan Y, et al. Genome-wide interrogation identifies YAP1 variants associated with survival of small-cell lung cancer patients. Cancer Res. 2010 Dec 1. 70(23):9721-9. [Medline]. Xun WW, Brennan P, Tjonneland A, Vogel U, Overvad K, el at. Single-nucleotide polymorphisms (5p15.33, 15q25.1, 6p22.1, 6q27 and 7p15.3) and lung cancer survival in the European Prospective Investigation into Cancer and Nutrition (EPIC). Mutagenesis. 2011 Sep. 26(5):657-66. [Medline]. Hermes A, Waschki B, Reck M. Hyponatremia as prognostic factor in small cell lung cancer--a retrospective single institution analysis. Respir Med. 2012 Jun. 106(6):900-4. [Medline]. Campling BG, Sarda IR, Baer KA, Pang SC, Baker HM, Lofters WS, et al. Secretion of atrial natriuretic peptide and vasopressin by small cell lung cancer. Cancer. 1995 May 15. 75(10):2442-51. [Medline]. Shepherd FA, Laskey J, Evans WK, Goss PE, Johansen E, Khamsi F. Cushing's syndrome associated with ectopic corticotropin production and small-cell lung cancer. J Clin Oncol. 1992 Jan. 10(1):21-7. [Medline]. Sher E, Gotti C, Canal N, Scoppetta C, Piccolo G, Evoli A, et al. Specificity of calcium channel autoantibodies in Lambert-Eaton myasthenic syndrome. Lancet. 1989 Sep 16. 2(8664):640-3. [Medline]. [Guideline] Wender R, Fontham ET, Barrera E Jr, Colditz GA, Church TR, Ettinger DS, et al. American Cancer Society lung cancer screening guidelines. CA Cancer J Clin. 2013 Mar-Apr. 63 (2):107-17. [Medline]. [Full Text]. [Guideline] Lung Cancer: Screening. U.S. Preventive Services Task Force. Available at http://www.uspreventiveservicestaskforce.org/Page/Document/UpdateSummaryFinal/lung-cancer-screening. December 2013; Accessed: May 22, 2018. Katki HA, Kovalchik SA, Petito LC, Cheung LC, Jacobs E, Jemal A, et al. Implications of Nine Risk Prediction Models for Selecting Ever-Smokers for Computed Tomography Lung Cancer Screening. Ann Intern Med. 15 May 2018. [Full Text]. Jenkins K. Which Smokers Should Be Screened for Lung Cancer?. Medscape Medical News. Available at https://www.medscape.com/viewarticle/896582. May 14, 2018; Accessed: May 22, 2018. [Guideline] NCCN Clinical Practice Guidelines in Oncology: Small Cell Lung Cancer. National Comprehensive Cancer Network. Available at http://www.nccn.org/professionals/physician_gls/pdf/sclc.pdf. Version 1.2019 — October 10, 2018; Accessed: March 19, 2019. [Guideline] Detterbeck FC, Lewis SZ, Diekemper R, Addrizzo-Harris D, Alberts WM. Executive Summary: Diagnosis and management of lung cancer, 3rd ed: American College of Chest Physicians evidence-based clinical practice guidelines. Chest. 2013 May. 143 (5 Suppl):7S-37S. [Medline]. [Full Text]. [Guideline] Ung YC, Maziak DE, Vanderveen JA, Smith CA, Gulenchyn K, Evans WK, for the Lung Cancer Disease Site Group. 18-fluorodeoxyglucose positron emission tomography in the diagnosis and staging of lung cancer: a clinical practice guideline. Toronto, Ontario: Cancer Care Ontario; 2007. [Full Text]. Thomson D, Hulse P, Lorigan P, Faivre-Finn C. The role of positron emission tomography in management of small cell lung cancer. Lung Cancer. 2011 Aug. 73(2):121-6. [Medline]. American Joint Committee on Cancer. Lung. AJCC Cancer Staging Manual Amin MB, Edge S, Greene F, Byrd DR, Brookland RK, et al, eds. AJCC Cancer Staging Manual. 8th edition. New York, NY: Springer; 2016. Dresler CM, Olak J, Herndon JE 2nd, Richards WG, el at. Phase III intergroup study of talc poudrage vs talc slurry sclerosis for malignant pleural effusion. Chest. 2005 Mar. 127(3):909-15. [Medline]. Zakowski MF. Pathology of small cell carcinoma of the lung. Semin Oncol. 2003 Feb. 30(1):3-8. [Medline]. Small Cell Lung Cancer Stages. American Cancer Society. Available at http://www.cancer.org/cancer/lungcancer-smallcell/detailedguide/small-cell-lung-cancer-staging. December 18, 2017; Accessed: May 22, 2018. Micke P, Faldum A, Metz T, Beeh KM, Bittinger F, Hengstler JG, et al. Staging small cell lung cancer: Veterans Administration Lung Study Group versus International Association for the Study of Lung Cancer--what limits limited disease?. Lung Cancer. 2002 Sep. 37(3):271-6. [Medline]. [Guideline] National Collaborating Centre for Cancer. Lung cancer. The diagnosis and treatment of lung cancer. Publication no. 121. London, UK: National Institute for Health and Clinical Excellence; 2011. [Full Text]. Halvorsen TO, Sundstrøm S, Fløtten Ø, Brustugun OT, Brunsvig P, Aasebø U, et al. Comorbidity and outcomes of concurrent chemo- and radiotherapy in limited disease small cell lung cancer. Acta Oncol. 2016 Aug 23. 1-9. [Medline]. Spigel DR, Townley PM, Waterhouse DM, Fang L, Adiguzel I, et al. Randomized phase II study of bevacizumab in combination with chemotherapy in previously untreated extensive-stage small-cell lung cancer: results from the SALUTE trial. J Clin Oncol. 2011 Jun 1. 29(16):2215-22. [Medline]. Lally BE, Urbanic JJ, Blackstock AW, Miller AA, Perry MC. Small cell lung cancer: have we made any progress over the last 25 years?. Oncologist. 2007 Sep. 12(9):1096-104. [Medline]. Hanna NH, Einhorn LH. Small-cell lung cancer: state of the art. Clin Lung Cancer. 2002 Sep. 4(2):87-94. [Medline]. Horn L, Mansfield AS, Szczęsna A, Havel L, Krzakowski M, Hochmair MJ, et al. First-Line Atezolizumab plus Chemotherapy in Extensive-Stage Small-Cell Lung Cancer. N Engl J Med. 2018 Dec 6. 379 (23):2220-2229. [Medline]. [Full Text]. Harrison P. After Decades, New Standard of Care in Small Cell Lung Cancer. Medscape Medical News. Available at https://www.medscape.com/viewarticle/902700. September 28, 2018; Accessed: October 10, 2018. Amarasena IU, Walters JA, Wood-Baker R, Fong K. Platinum versus non-platinum chemotherapy regimens for small cell lung cancer. Cochrane Database Syst Rev. 2008 Oct 8. CD006849. [Medline]. Noda K, Nishiwaki Y, Kawahara M, Negoro S, Sugiura T, Yokoyama A, et al. Irinotecan plus cisplatin compared with etoposide plus cisplatin for extensive small-cell lung cancer. N Engl J Med. 2002 Jan 10. 346(2):85-91. [Medline]. Jiang L, Yang KH, Guan QL, Mi DH, Wang J. Cisplatin plus etoposide versus other platin-based regimens for patients with extensive small-cell lung cancer: a systematic review and meta-analysis of randomised, controlled trials. Intern Med J. 2012 Dec. 42(12):1297-309. [Medline]. Hanna N, Bunn PA Jr, Langer C, Einhorn L, Guthrie T Jr, Beck T, et al. Randomized phase III trial comparing irinotecan/cisplatin with etoposide/cisplatin in patients with previously untreated extensive-stage disease small-cell lung cancer. J Clin Oncol. 2006 May 1. 24(13):2038-43. [Medline]. Ready NE, Pang HH, Gu L, Otterson GA, Thomas SP, Miller AA, et al. Chemotherapy With or Without Maintenance Sunitinib for Untreated Extensive-Stage Small-Cell Lung Cancer: A Randomized, Double-Blind, Placebo-Controlled Phase II Study-CALGB 30504 (Alliance). J Clin Oncol. 2015 May 20. 33 (15):1660-5. [Medline]. Schmittel A, Sebastian M, Fischer von Weikersthal L, et al. A German multicenter, randomized phase III trial comparing irinotecan-carboplatin with etoposide-carboplatin as first-line therapy for extensive-disease small-cell lung cancer. Ann Oncol. 2011 Aug. 22(8):1798-804. [Medline]. Rossi A, Di Maio M, Chiodini P, Rudd RM, Okamoto H, Skarlos DV, et al. Carboplatin- or cisplatin-based chemotherapy in first-line treatment of small-cell lung cancer: the COCIS meta-analysis of individual patient data. J Clin Oncol. 2012 May 10. 30(14):1692-8. [Medline]. Klasa RJ, Murray N, Coldman AJ. Dose-intensity meta-analysis of chemotherapy regimens in small-cell carcinoma of the lung. J Clin Oncol. 1991 Mar. 9(3):499-508. [Medline]. Arriagada R, Le Chevalier T, Pignon JP, Riviere A, Monnet I, Chomy P, et al. Initial chemotherapeutic doses and survival in patients with limited small-cell lung cancer. N Engl J Med. 1993 Dec 16. 329(25):1848-52. [Medline]. Takada M, Fukuoka M, Kawahara M, Sugiura T, Yokoyama A, Yokota S, et al. Phase III study of concurrent versus sequential thoracic radiotherapy in combination with cisplatin and etoposide for limited-stage small-cell lung cancer: results of the Japan Clinical Oncology Group Study 9104. J Clin Oncol. 2002 Jul 15. 20(14):3054-60. [Medline]. Turrisi AT 3rd, Kim K, Blum R, Sause WT, Livingston RB, Komaki R, et al. Twice-daily compared with once-daily thoracic radiotherapy in limited small-cell lung cancer treated concurrently with cisplatin and etoposide. N Engl J Med. 1999 Jan 28. 340(4):265-71. [Medline]. Slotman B, Faivre-Finn C, Kramer G, Rankin E, Snee M, Hatton M, et al. Prophylactic cranial irradiation in extensive small-cell lung cancer. N Engl J Med. 2007 Aug 16. 357(7):664-72. [Medline]. Schild SE, Foster NR, Meyers JP, Ross HJ, Stella PJ, et al. Prophylactic cranial irradiation in small-cell lung cancer: findings from a North Central Cancer Treatment Group Pooled Analysis. Ann Oncol. 2012 Nov. 23(11):2919-24. [Medline]. Natale R, Lara P, Chansky K, et al. A randomized phase III trial comparing irinotecan/cisplatin (IP) with etoposide/cisplatin (EP) in patients (pts) with previously untreated extensive stage small cell lung cancer (E-SCLC). J Clin Oncol. 2008;26 (suppl):400s. Heigener D, Freitag L, Eschbach C et al. Topotecan/cisplatin (TP) compared to cisplatin/etoposide (PE) for patients with extensive disease-small cell lung cancer (ED-SCLC): final results of a randomised phase III trial. J Clin Oncol. 2008;26 (suppl):400s. Slotman BJ, van Tinteren H, Praag JO, Knegjens JL, El Sharouni SY, Hatton M, et al. Use of thoracic radiotherapy for extensive stage small-cell lung cancer: a phase 3 randomised controlled trial. Lancet. 2015 Jan 3. 385 (9962):36-42. [Medline]. [Full Text]. Takahashi T, Yamanaka T, Seto T, Harada H, Nokihara H, Saka H, et al. Prophylactic cranial irradiation versus observation in patients with extensive-disease small-cell lung cancer: a multicentre, randomised, open-label, phase 3 trial. Lancet Oncol. 2017 May. 18 (5):663-671. [Medline]. Harris S, Chan MD, Lovato JF, Ellis TL, Tatter SB, Bourland JD, et al. Gamma knife stereotactic radiosurgery as salvage therapy after failure of whole-brain radiotherapy in patients with small-cell lung cancer. Int J Radiat Oncol Biol Phys. 2012 May 1. 83(1):e53-9. [Medline]. GlaxoSmithKline. GSK receives approval for Hycamtin(R) (topotecan) capsules for the treatment of relapsed small cell lung cancer [press release]. October 15, 2007. Available at https://www.fiercebiotech.com/biotech/press-release-gsk-receives-approval-for-hycamtin-capsules. October 15, 2007; Accessed: September 7, 2018. Jotte R, Conkling P, Reynolds C, Galsky MD, Klein L, Fitzgibbons JF, et al. Randomized phase II trial of single-agent amrubicin or topotecan as second-line treatment in patients with small-cell lung cancer sensitive to first-line platinum-based chemotherapy. J Clin Oncol. 2011 Jan 20. 29(3):287-93. [Medline]. Goto K, Ohe Y, Shibata T, Seto T, Takahashi T, Nakagawa K, et al. Combined chemotherapy with cisplatin, etoposide, and irinotecan versus topotecan alone as second-line treatment for patients with sensitive relapsed small-cell lung cancer (JCOG0605): a multicentre, open-label, randomised phase 3 trial. Lancet Oncol. 2016 Aug. 17 (8):1147-1157. [Medline]. Schreiber D, Rineer J, Vongtama D, et al. Surgery for limited-stage small cell lung cancer, should the paradigm shift? A SEER-based analysis. J Clin Oncol (Suppl). 2008. 26:403s. Anraku M, Waddell TK. Surgery for small-cell lung cancer. Semin Thorac Cardiovasc Surg. 2006 Fall. 18(3):211-6. [Medline]. [Guideline] Jaklitsch MT, Jacobson FL, Austin JH, Field JK, Jett JR, Keshavjee S, et al. The American Association for Thoracic Surgery guidelines for lung cancer screening using low-dose computed tomography scans for lung cancer survivors and other high-risk groups. J Thorac Cardiovasc Surg. 2012 Jul. 144 (1):33-8. [Medline]. [Guideline] Rivera MP, Mehta AC, Wahidi MM. Establishing the diagnosis of lung cancer: Diagnosis and management of lung cancer, 3rd ed: American College of Chest Physicians evidence-based clinical practice guidelines. Chest. 2013 May. 143 (5 Suppl):e142S-65S. [Medline]. [Full Text]. [Guideline] Rudin CM, Ismaila N, Hann CL, Malhotra N, Movsas B, Norris K, et al. Treatment of Small-Cell Lung Cancer: American Society of Clinical Oncology Endorsement of the American College of Chest Physicians Guideline. J Clin Oncol. 2015 Dec 1. 33 (34):4106-11. [Medline]. [Full Text]. Frank AL. Epidemiology of lung cancer. Roth JA, Ruckdeschel J, Weisenburger T, eds. Thoracic Oncology. Philadelphia, Pa: WB Saunders Co; 1989. 6-15. Mazzone PJ, Silvestri GA, Patel S, Kanne JP, Kinsinger LS, Wiener RS, et al. Screening for Lung Cancer: CHEST Guideline and Expert Panel Report. Chest. 2018 Apr. 153 (4):954-985. [Medline]. [Full Text]. This coronal positron emission tomogram shows a large, focal, hypermetabolic area on the right that is consistent with a large mass in the central portion of the right upper pulmonary lobe. Multiple other smaller hypermetabolic areas suggest lymph-node metastatic disease in the chest, abdomen, and right supraclavicular region. ACTH = adrenocorticotropic hormone; SCLC = small cell lung cancer; SIADH = syndrome of inappropriate antidiuretic hormone. AJCC = American Joint Committee on Cancer.